Now it's easier than ever to book the biggest names in entertainment to appear at your party or event, whether you're planning a birthday party or a corporate gathering. Whether your event is at the Oklahoma City Museum of Art or the Cox Convention Center, the success of your event could very well depend on the entertainment you provide. Providing all in one no-surprise price, Booking Entertainment has been assisting clients with full-service, turnkey events, including headlining entertainment, for almost twenty years. To help make your Oklahoma City area event exciting and rewarding, almost any act is available, and we can help you make those arrangements. In addition to booking the act, numerous additional elements go in to incorporating live entertainment at your Oklahoma City area event. These elements include fees, flights, ground transportation, hotel accommodations, staging, lights, sound, backline equipment, per diems, misc. rider requirements and an onsite staff to produce the musical portion of the event. The best way to start is with the Entertainment Request Form. Use it to provide us with more information about your upcoming event in the Oklahoma City area. You will hear from one of our agents within twenty-four hours, to chat with you about the process and see if you have any other questions. 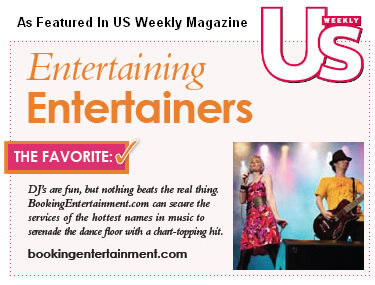 Booking Entertainment has enjoyed almost 20 years in the business, and we'd be delighted to make your Oklahoma City area event an outstanding experience.